Advances in diamond tool technology coupled with better understanding of "down the hole" behaviour have lead to the emergence of ever more efficient and economical Impregnated Core Bits. The objective of an Impregnated Core Bit is to provide a bit where the bit matrix erodes at a rate whereby when active diamonds become worn and blunt, these diamonds will be discarded enabling new fresh diamonds to be exposed to the substance being drilled. 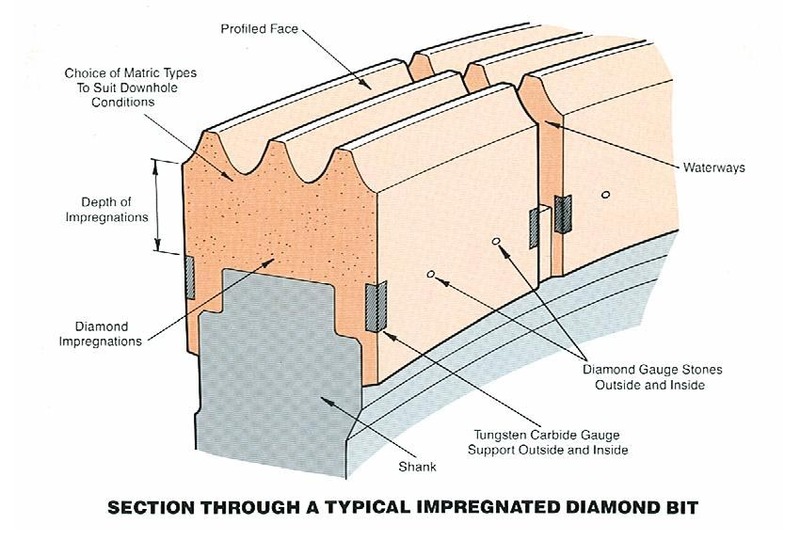 The matrix is critical in a successful Impregnated Core Bit as this matrix must have the ability to retain the diamonds for just as long as they continue to provide an efficient cutting function, which, when those worn diamonds that have ceased providing this function, will be stripped from the matrix and allow fresh, sharp diamonds to be exposed to continue the cutting operation. 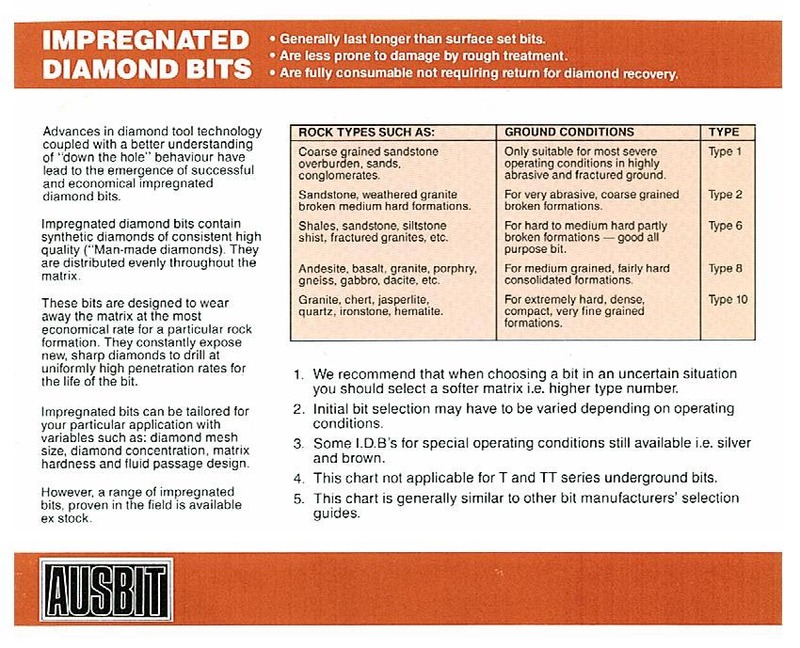 Impregnated diamond bits contain synthetic diamonds of high quality which are distributed evenly throughout the matrix. Ceramco has progressively introduced new and improved impregnated core bit matrices as a result of market requirements and advances in technology. While Ceramco can provide custom impregnated bits tailored to individual requirements, a complete range of industry standard AUSBIT series and DIAMINDRILL series of Impregnated Core Bits are available ex stock from series 1 through to series 14. 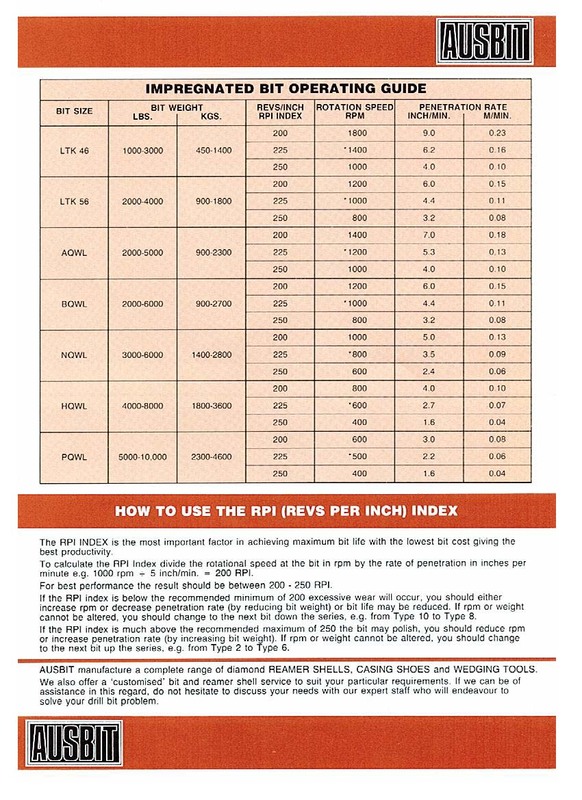 The Bit Series Table is able to provide an indicative guide as to which series of bit will be appropriate given a particular rock formation. NB: This image needs to be expanded by hovering your mouse over the image and clicking the expand icon that appears in the bottom right corner of the image. The Impregnated Bit Operating Guide will be of assistance in achieving maximum bit life with the lowest bit cost thereby giving the best productivity. NB: This image needs to be expanded by hovering your mouse over the image and clicking the expand icon that appears in the bottom right corner of the image.